Microsoft's Windows 8.1 is due out Oct. 17, but Chinese OEM Lenovo is apparently sick of waiting for the Windows 8 update to bring back the traditional Windows Start menu. The company decided to take matters into its own hands, and the maker of Start menu software Pokki announced this week that future Lenovo PCs will have its custom Start menu pre-installed. Pokki, made last year by a start-up called Sweetlabs, adds a Start menu to Windows 8 that's similar to what was found in Windows 7 and earlier OS versions. Bloomberg reported that three million Windows 8 users have already downloaded the Pokki software independently from Sweetlabs' website. Windows 8.1 brings back the Start menu in part, but it's still not a full traditional desktop experience. That's why software like Pokki could remain relevant even as Microsoft attempts to fix its own missteps. Lenovo's Pokki-equipped computers will arrive in the next few weeks starting in English-speaking countries and eventually covering all Lenovo computers globally. Pokki also includes an app store, and part of Sweetlabs' deal with Lenovo is that the companies will share the profits from app sales. The start-up is backed by Intel and Google Ventures, and Bloomberg reported that it's in talks with other manufacturers to include its Start menu on their systems as well. Lenovo is currently the top PC maker in the world, and unlike other OEMs it seems the company has had no trouble selling Windows machines lately. Besides the addition of a Windows Start menu, Windows 8.1 adds myriad improvements to both the traditional desktop and the modern tile interface portions of the operating system. It also includes Internet Explorer 11, the new version of Microsoft's browser that's said to be a massive improvement. 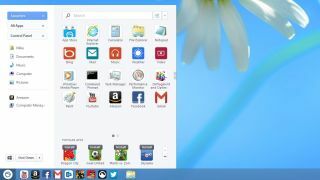 Pokki isn't the only Start menu replacement in town - TechRadar tried out six different choices.